Preliminary studies in the Vx2 model showed that paclitaxel incorporated into the outer lipid membrane of PFC nanoparticles was not effective for anti-angiogenesis whereas fumagillin was. (Additional file 1: Supplemental Figure 1) In vivo pharmacokinetic studies revealed that both fumagillin and paclitaxel included in the PFC nanoparticle lipid membrane were significantly lost in circulation en route to the endothelial target cells, with the premature release of the taxane occurring quicker and to a greater extent than the more hydrophobic fumagillin. Schematic representation of the concept of the lipase-cleavable Sn 2 phosphatidylcholine docetaxel prodrug: The lipophilic docetaxel prodrug is incorporated into the phospholipid surfactant, where the drug enters the protective hydrophobic acyl layer. The active pharmaceutical ingredient (API) is protected from premature dissolution into serum or serum lipase liberation during circulation to the target. 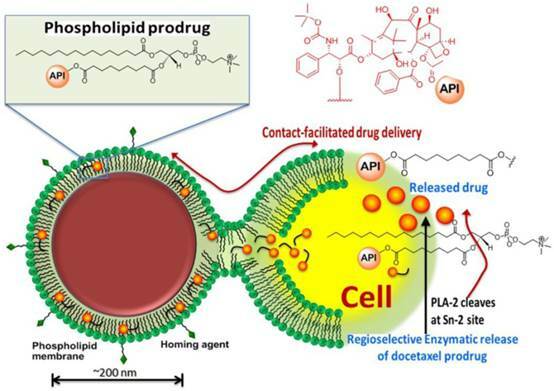 The API is delivered to the target cell through a “contact facilitated drug delivery” (CFDD) mechanism wherein the prodrug exchanges passively into the outer target cell leaflet. The prodrug transfers through an ATP dependent mechanism into the inner cell membrane leaflet, which is contiguous with the internal cell membranes (except the mitochondria). The prodrug undergoes a region-selective enzymatic cleavage at the Sn 2 site by phospholipases, such as phospholipase A-2 (PLA-2), but up to 60 endothelial lipases could functionally participate in drug liberation into the cytosol. The objectives of the present work were: 1) to develop and characterize an Sn 2 lipase-labile prodrug of docetaxel (Dxtl-PD); 2) to demonstrate the stability of the taxane prodrug in the PFC nanoparticles in the presence of serum and excess lipase, 3) to demonstrate the anti-neovascular efficacy of the agent in the rabbit Vx2 cancer model using magnetic resonance (MR) angiogenesis molecular imaging, 4) to demonstrate the efficacy advantage of the integrin-targeted Dxtl-PD nanoparticle compared with the molar equivalent dose of Abraxane® given systemically, 5) to microscopically characterize the impact of targeted Dxtl-PD on intratumoral apoptosis and cell proliferation. Docetaxel (AvaChem Scientific), a clinically relevant broad-spectrum anticancer agent, was utilized in the present study for site-specific anti-angiogenesis therapy. Docetaxel has a low solubility in water (<0.1 μg/ml) and from the synthetic stand point, chemistries involving esterification of the 2'-hydroxyl group, which is the most reactive of the hydroxy groups, is feasible. Any conventional method of protecting a hydroxy group, such as esterification, can be utilized to protect this hydroxy group at the 2' position, while leaving the hydroxy groups at the 7 and 10 positions free for reaction. 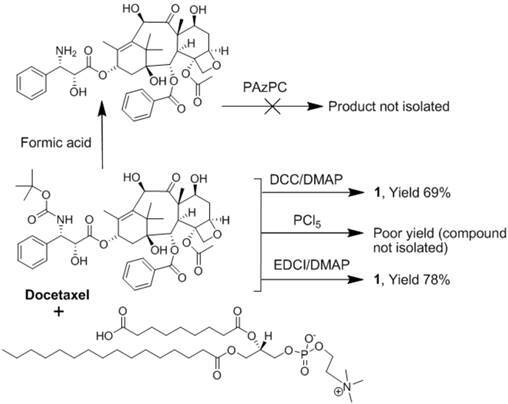 For the synthesis of docetaxel prodrug, several coupling methods were attempted that included dicyclohexyl carbodiimide (DCC) / dimethylaminopyridine (DMAP), phosphorous pentachloride (PCl5), and 1-ethyl-3-(3-dimethylaminopropyl) carbodiimide/dimethylaminopyridine (EDCI/DMAP). A summary of those results are consolidated into Figure 2. Among these reagents, EDCI/DMAP was the most efficient approach and produced the desired compound in 78% yield. (Figure 3) The compound was isolated and purified by preparative thin layer chromatography (prep-TLC) and the structure was confirmed by NMR and ESI MS spectroscopy. Paclitaxel prodrug (Kereos, Inc., St. Louis, MO) was prepared analogously as illustrated and described in the Additional file 1: Supplemental Figure 2. Of note, specific 2'-modification of docetaxel was drawn from analogy based on the scientific literature when 1H-NMR spectroscopic studies to confirm the conjugation at the 2' position failed to resolve the overlapping resonating peaks from the neighboring protons of the tetracyclic 17-carbon (heptadecane) skeleton. Further, the initial approach to synthesize Dxtl-PD involved coupling chemistries through deprotected 3'-NH2 group. (Figure 2) Docetaxel was subjected to hydrolytic deprotection in presence of formic acid to produce 3'-amine deprotected docetaxel. However, the attempted conjugation of 1-palmitoyl-2-azelaoyl-sn-glycero-3-phosphocholine (PAz-PC) through the free amine group resulted in a complex mixture of products and the desired compound was never isolated. Summary of the attempted synthetic approaches to docetaxel phosphatidylcholine prodrug. Sn 2 Docetaxel Prodrug. 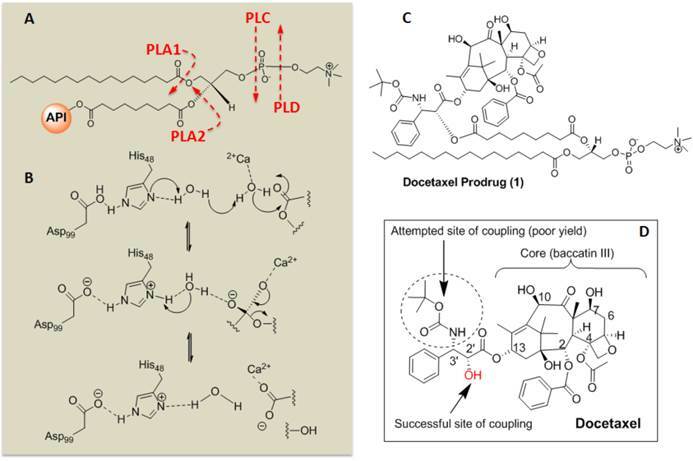 (A) Cleavage sites of phospholipase enzymes, PLA2 regiospecifically recognizes the Sn 2 acyl bond of phospholipids; (B) predicted mechanistic pathways of hydrolysis catalyzed by PLA2; (C) structure of the docetaxel prodrug synthesized in this work; (D) structure of parent molecule docetaxel and depicting different sites for functionalization and activity. PLA2 = phospholipase A2, PLA1=phospholipase A1. Mouse vascular endothelial cells (2F2B) were plated at 2500 cells/well in media with Angiotensin II (1nM) for overnight culture at 37°C, 5% CO2. Cells were treated with paclitaxel, docetaxel, paclitaxel prodrug, or docetaxel prodrug at 0.5 µg/ml, 1 µg/ml, 5 µg/ml, 10 µg/ml, 50 µg/ml and 100 µg/ml for 1 hour with mild agitation. The treatments were removed; cells were washed three times with PBS; fresh media was added; and the plates were returned back to the incubator. Cell proliferation was assayed at 24, 48, and 72 hours. At each time point, 20 µl of Alamar Blue was added to each well and incubated for 4 hours. The supernatants were transferred to a new replicate plate for spectroscopic analysis. The original wells were replenished with fresh media and all plates were returned to the incubator until the next time point. The reaction was monitored using a fluorescence plate reader (λex 570nm, λem 585nm) where the resulting signal is proportional to the number of viable cells present. Signal intensity from each sample was normalized to signal from the positive saline control. Each treatment was replicated three times. The stability of the Dxtl-PD incorporated at 2 mole% (3.75 wt%) into the surfactant (360mg) of PFC nanoparticles was evaluated by dissolution in plasma and buffer over three days in triplicate. Drug-laden nanoparticles were secured within dialysis tubing (MWCO=60K, Spectrum Laboratories, Inc.), which were washed externally to remove possible surface contamination, and then incubated in 3.5 ml of human plasma at 37°C for 3 days with constant slow rotation. The dialysis tube samples were transferred to 3.5 ml of fresh plasma daily and 200µl of the 3.5 ml dialysate was injected into a reversed-phase HPLC system (Waters 600S controller, 626 delivery pump, 717 auto sampler, and 2487 Dual λ absorbance detector) through a 0.2 µm syringe filter for analysis of prodrug release. Dxtl-PD was detected at a wavelength 227 nm. A Grace Vydac C18 column, 4.6 x 250 mm, was used with a mobile phase consisting of: (A) 80% acetonitrile, 20% methanol and (B) 100% 0.2 M ammonium acetate, pH 4.5 using gradient conditions (from 100% A to 40% A 60% B within 30 min then returning to 100% A in 5 min for an additional 5 min (run time 40 min; drug retention time ~33 min). Flow rate was 1 ml/min. To further assess the potential susceptibility of Dxtl-PD in PFC nanoparticles to premature lipase liberation, drug-laden nanoparticles (250 µl) were incubated for 24 hours with 3.5 ml fresh plasma or fresh whole blood preserved with EDTA each spiked with 250 µl 0.9 % NaCl, 15-30 mM CaCl2 and 0.278 mg phospholipase A2. This was referenced to an equimolar amount of Dxtl or Dxtl-PD in DMSO diluted in 3.5ml of PBS pH 7.4. The samples were continuously agitated on a nutator to prevent settling. As a positive control, 250 µl 2-propanol was added to the lipase-spiked plasma containing Dxtl-PD in PFC nanoparticles to “crack” the emulsion's integrity, exposing the lipase-labile prodrug to the enzyme-rich plasma milieu. The plasma-enzyme-NP mixture (250 µl) was combined with 250 µl Cleanascite™ for lipid removal and clarification (Biotech Support Group, Inc., Monmouth Junction, NJ) at 25°C for 15min. The mixture was centrifuged at 5000 rpm (30 min) and the supernatant (200 µl) was analyzed by HPLC. To determine the potential exchange of Dxtl-PD from the nanoparticle surfactant to erythrocyte membranes, 2-propranolol (200 µl) and water (200 µl) were added to the erythrocyte aliquot (100 µl) and the mixture was centrifuged at 1000 rpm for 10 min. The RBC fraction was separated from the pelleting PFC nanoparticles (specific gravity of 2). The RBC fraction was analyzed in triplicate for the Dxtl-PD and its major metabolites by HPLC. Mouse endothelial cells (2F2B; ATCC® CRL2168™, Manassas, VA) were seeded on a 96 well plate (2000-5000 cells/well) in Dulbecco's Modified Eagle's Medium (DMEM) with 4.5 g/L glucose; L-glutamine; and 10% heat-inactivated fetal bovine serum plus 10 µM angiotensin II (Sigma Chemical Co, St. Louis, MO) and incubated at 37ºC with 5% CO2. After 24 hours, cells were incubated for 1 hour with 1) αvβ3-Dxtl-PD NPs, 2) equimolar equivalent of Taxol® (0.3 µM), 3) αvβ3-No drug NPs, or 4) saline. After incubation the wells were washed three times with PBS and returned to the incubator. At 96 hours after drug exposure, cell proliferation was measured using the MTT assay for cytotoxicity, which measures the activity of cellular enzymes that reduce the tetrazolium dye, MTT, to the insoluble formazan (Invitrogen; Carlsbad, CA, USA). Each treatment was replicated 6 times. In a confirmatory experiment using human endothelial cells (HUVEC; Lonza Walkersville, MD, USA), cell metabolic activity was assessed using a Vybrant Cell Metabolic Assay Kit (Invitrogen). The experiment was conducted as described above with 6 replicates/treatment and measurements assessed at 48, 72, and 96 hours. The treatments applied were: αvβ3-Dxtl-PD NPs, free Dxtl in methanol (0.3 µM) and αvβ3-No drug NPs. This assay is based on the reduction of non-fluorescent C12-resazurin to red-fluorescent C12-resorufin in metabolically active cells, which is attributed to different oxido-reductase enzyme systems that use NAD(P)H as the primary electron donor. The redox reaction was monitored using a fluorescence plate reader (λex 570nm, λem 587nm) where the resulting signal is proportional to the number of viable cells present. Signal intensity from each sample was normalized to signal from the positive control (αvβ3-targeted no drug nanoparticles). All animal studies were conducted in accordance with a protocol approved by the Washington University Animal Studies Committee. The anti-angiogenesis effects of Dxtl-PD were evaluated in the Vx2 rabbit tumor model using MR angiogenesis imaging and histology. Male New Zealand White rabbits (~2 kg) were anesthetized with intramuscular ketamine and xylazine. One hind leg was shaved, prepped under sterile conditions, and infiltrated with Marcaine. A 2-3 mm3 rabbit Vx2 tumor fragment (squamous cell carcinoma, National Cancer Institute Tumor Repository, Frederick, MD, USA) was implanted at a depth of approximately 0.5 cm through a small incision into the popliteal fossa. Anatomical planes were closed and secured with a single absorbable suture. The skin was sealed with Dermabond skin glue. Animals were recovered by reversing the effect of ketamine and xylazine with yohimbine. On days 9, 12 and 15 post tumor implantation, rabbits were treated with either: αvβ3-Dxtl-PD NP, non-targeted Dxtl-PD NPs, or αvβ3-targeted no drug NPs at a 2ml/kg i.v. dose. On day 17, rabbits were imaged in a clinical 3T MR scanner (Philips Achieva) with an 8-element SENSE coil using a high-resolution, T1-weighted, fat suppressed, 3D gradient echo sequence (TR/TE = 42/5.7ms, 45o flip angle, 2 NSA, 0.25 x 0.25 x 0.5 mm resolution). Images were obtained before and 3 hours after i.v. administration of αvβ3-Gd-DOTA NP (1ml/kg) to compare the influence of the three treatments on angiogenesis. At each time point, rabbits were anesthetized with 1% to 2% Isoflurane in oxygen to effect. In a second cohort of rabbits (n=4/group), the anti-angiogenesis effect of serially administered Abraxane® at the same drug dose and days of treatment described above were compared to an analogously treated saline control. MRI molecular imaging of tumor volumes and angiogenesis as well as image post processing were performed as described. In each experiment, the signal intensities of the MR images were analyzed with MATLAB software (The Math Works, Natick, MA, USA). Dynamic T1-weighted signal intensities were normalized to a Gd-DTPA doped water reference standard included within each imaging field-of-view. For each animal, a region-of-interest (ROI) was manually placed around the tumor edge on each baseline slice, and the standard deviation of the average tumor signal at baseline was calculated. Voxels on post-injection MRI images were defined as enhanced if the signal intensity exceeded the mean tumor signal at baseline by more than three standard deviations. The tumor ROI was automatically partitioned into a rim and core region using an automated erosion method developed in MATLAB. The core region was set to approximately half of the ROI volume. The volume of enhancement was calculated, as well as the relative distribution of enhancing voxels in the periphery versus the core of the tumor. High-resolution 3D tumor reconstructions were created in MATLAB to map the spatial distribution of enhancing neovasculature in each treatment group. The overall 3D structure of the tumor was displayed as a mesh surface plot using isosurface rendering and a smoothing filter. A surface plot of the enhancing voxels was reconstructed similarly, and overlaid onto the tumor volume. Immediately after MR imaging, animals were euthanized, and tumors were resected, weighed, and frozen in optimum cutting temperature (OCT) compound. Tumors (n=4/treatment group) were sectioned and stained for cell proliferation (proliferating cell nuclear antigen, PCNA) antibody; Abcam, Cambridge, MA, USA) and apoptosis (TUNEL assay; Promega, Madison, WI, USA) to corroborate MR results. Microscopic images (40x) were obtained with an Olympus BX61 microscope, Color-view CCD Camera and analyzed with ImageJ software using manual placement of regions of interest on each microscopic image (National Institute of Mental Health, Bethesda, Maryland, USA.). Data were analyzed using analysis of variance (SAS Inc.; Cary, NC, USA) (p < 0.05). Data are presented as the mean ± standard error of the mean unless otherwise stated. Collectively, these results suggest that Dxtl-PD is snuggled into the hydrophobic membrane and protected from hydrolysis and lipase activation in plasma until the nanoparticle is destabilized, such as with alcohol. Over the relatively brief time course of systemic targeting, αvβ3-Dxtl-PD NP retention of drug is anticipated to be very high, as opposed to earlier results with free paclitaxel dissolved into the surfactant, with negligible passive transference to co-circulating erythrocytes. Characterization of docetaxel prodrug (Dxtl-PD) loaded PFC nanoparticles (NP). (A) Number-averaged hydrodynamic diameter distribution of αvβ3-Dxtl-PD in hydrated state; (B) transmission electron microscopy (TEM) image of the integrin targeted nanoparticles (scale bar: 200 nm); (C) dissolution of Dxtl-PD over 3 days when incubated in PBS with albumin (red) or human plasma (green); HPLC traces of Dxtl-PD (D), Dxtl-PD-NP treated with PLA2 (E) and Dxtl-PD-NP “cracked” with isopropanol and exposed to PLA2. PLA2=phospholipase A2. Mouse vascular endothelial cells (2F2B) stimulated with angiotensin II (1nM) were treated with paclitaxel, docetaxel, paclitaxel prodrug, or docetaxel prodrug at 0.5 µg/ml, 1 µg/ml, 5 µg/ml, 10 µg/ml, 50 µg/ml and 100 µg/ml for 1 hour. Cultures were monitored for proliferation at 24, 48, and 72 hours. No difference (p= NS) in biopotency of the different taxane forms was detected. A) Cell proliferation via MTT assay comparing docetaxel prodrug targeted to angiotensin II activated integrin receptor in 2F2B endothelial cells versus Taxol® and no drug targeted particles. At 96 hours, the prodrug was significantly (p < 0.05) more effective than the control and at least equivalent to Taxol®. B) Cell proliferation via Vybrant Cell Metabolic Assay comparing docetaxel prodrug in HUVEC endothelial cells versus docetaxel in methanol and no drug targeted particles. 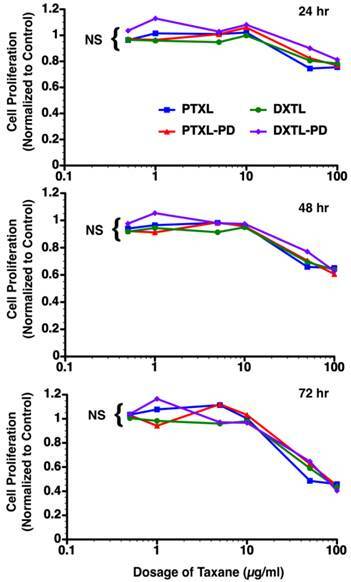 Marked and equivalent reductions in cell proliferation were appreciated at 48, 72, and 96 hours with free drug and the integrin targeted Dxtl-PD NPs. * p<0.05. In a follow up experiment using angiotensin II stimulated HUVEC cells, cell metabolic activity responses to nanoparticle delivered docetaxel were assessed at earlier time points: 48, 72, and 96 hours. (Figure 6b) In this experiment native docetaxel in methanol added to the medium was compared to its integrin targeted lipase-labile prodrug analog on an equimolar drug basis. The treatments applied were: αvβ3-Dxtl-PD NPs, free Dxtl, and αvβ3-no drug NPs. 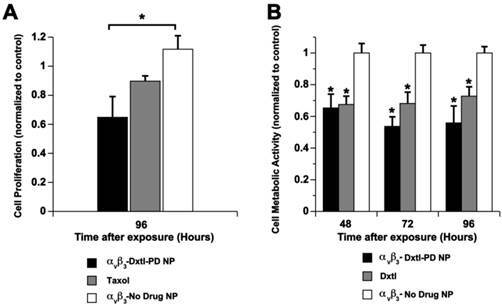 As shown in Figure 6b, the nanoparticle delivered docetaxel prodrug or parent compound equivalently decreased (p<0.05) cell metabolic activity at 48 hours when compared with the targeted no-drug nanoparticle control. The marked reductions in cell metabolic activity persisted for both drug forms at 72 and 96 hours. These results substantiate the comparable bioequivalence of the native docetaxel and targeted Sn 2 lipase-labile prodrug in angiotensin II activated endothelial culture. These data further suggest that the intracellular enzymatic hydrolysis requirement to achieve efficacy of Dxtl-PD was not limiting in the activated HUVEC cells. In a previously unpublished pilot study, the effectiveness of paclitaxel incorporated into the membrane of αvβ3-targeted PFC nanoparticles was evaluated in the Vx2 tumor model (Additional file 1: Supplemental Figure 1). The results showed that serial doses of the agent produced neither anti-neovascular nor anti-tumor benefit when evaluated by MR molecular imaging with αvβ3-paramagnetic PFC nanoparticles. Studies simultaneously tracking the perfluorocarbon core, paclitaxel, and homing ligand in whole blood from rats showed that the particles were intact but the drug was rapidly and prematurely loss from the lipid membrane (Kereos, St. Louis, unpublished data). 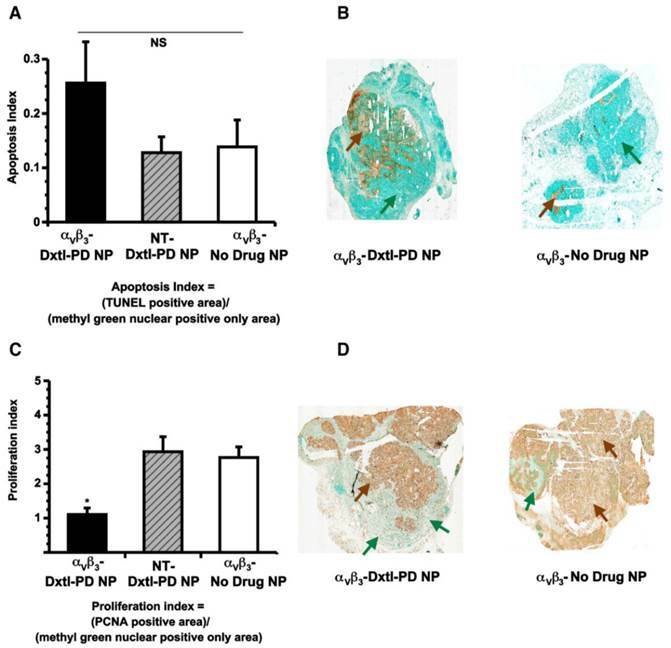 In the present study, the efficacy of the docetaxel Sn 2 prodrug incorporated into the lipid membrane of αvβ3-targeted PFC nanoparticles (αvβ3-Dxtl-PD NP) was compared in the Vx2 rabbit tumor model to non-targeted Dxtl-PD NPs (NT-Dxtl-PD NP) and αvβ3-No Drug NPs. Animals were serially treated on days 9, 12, and 15 days post implant. On day 17, rabbits were imaged in a clinical 3T MR scanner (Philips Achieva) using a high-resolution, T1-weighted, fat suppressed, 3D gradient echo sequence at baseline and 3 hours after i.v. administration of αvβ3-Gd-DOTA nanoparticles (1ml/kg), previously characterized and demonstrated in vivo. 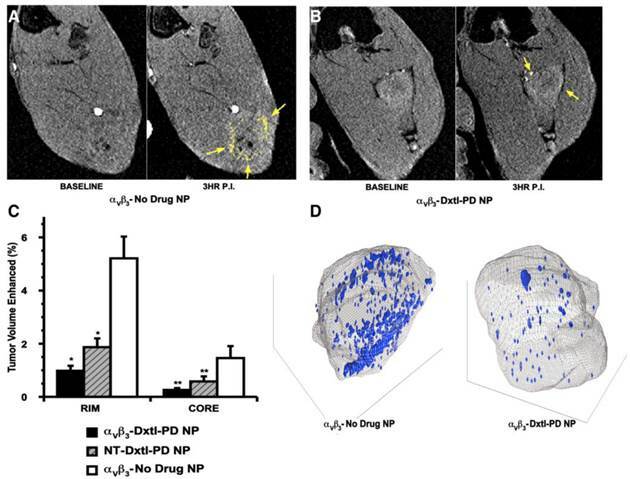 To verify that the neovascular effect of the Dxtl-PD NP, appreciated by MR molecular imaging, was not attributable to the systemic premature release of taxanes in one or both groups, a separate cohort of rabbits implanted with the Vx2 tumor were treated serially with Abraxane® given at an equimolar dose and compared to a saline control. MR molecular imaging of angiogenesis with αvβ3-Gd-DOTA nanoparticles on day 17 revealed no anti-angiogenic effectiveness in the Abraxane® treated rabbits versus the controls. (Figure 8) In fact, the magnitudes of neovascular contrast measured in each group were nearly identical, as were the tumor volumes (Additional file 1: Supplemental Figure 6). These results demonstrate that the retention and delivery method of Dxtl-PD in the nanoparticle was essential to elicit the MR measureable change in tumor neovasculature. A) T1w MR images of Vx 2 tumor obtained at baseline and 3 hours after αvβ3-Gd-DOTA NP in animals receiving αvβ3-no drug NP showing peripheral tumor angiogenesis contrast enhancement false colored in yellow. B) The same image sequence as panel A in Vx2 tumor rabbits following αvβ3-Dxtl-PD NP. C) Histogram illustrating marked angiogenesis in the control rabbits rim (tumor peripheral 50%) versus those receiving Dtxl-PD with or without targeting. Note minimal contrast signal with the tumor core. Marked decrease in contrast in nontargeted (NT) animal group suggests that the dosage or frequency of treatment was in excess of the therapeutic need with passive entrapment providing adequate particle-to-endothelium contact to afford significant anti-angiogenesis. D) Representative 3D neovascular maps of Vx2 tumor in control and targeted Dxtl-PD treatment groups. Note asymmetric distribution of confluent neovascular regions in the control rabbit was not appreciated in the treated animal. Blue voxels equate to αvβ3-Gd-DOTA NP contrast enhancement exceeding 3 standard deviations over baseline. * p<0.05, ** p<0.01. Vx 2 tumor angiogenesis following serial dosages of Abraxane® (equivalent to treatment regimen used in Figure 7) versus control rabbits receiving saline as assessed by MR molecular imaging with αvβ3-Gd-DOTA NP. No effect of the free taxane drug was detected, which was equivalent to the results previously obtained with free Taxol® in the preliminary data (Additional file 1: Supplemental Figure 1). Histological assessments of tumor showed that αvβ3-Dxtl-PD NP decreased (p<0.05) tumor cell proliferation, as assessed by PNCA staining of the lesion. (Figure 9c,d) The same trend was measured for tumor apoptosis. (Figure 9a,b) In each case, the patterns of staining appeared as patchy confluencies, distributed variably among animal tumors. These data suggest that targeted delivery of Dxtl-PD was biologically more effective than NT Dxtl-PD treatment, which is consistent with previously reported dynamic imaging results discussed above. Further, while MR angiogenesis imaging is able to robustly track the progression of Vx2 tumor neovasculature around 12 days post implantation or longer, MR sensitivity may permit only assessment of the macroscopic changes of neovasculature and may not adequately resolve microscopic differences in neovasculature which may still impart significant tumor biology impact. Changes in microvasculature counts following theranostic anti-angiogenesis treatment were correlated previously with MR molecular imaging of angiogenesis in atherosclerotic rabbits, However, given the extensive heterogeneity of angiogenesis presentation in the tumor, replication here would require complete serial sectioning and quantification of neo/microvasculature to compare the extent of microscopic angiogenesis persisting with and without integrin-targeting, and was precluded in this project. A) Histogram showing a trend (nonsignificant (NS), p = 0.2) toward increased apoptosis among Vx 2 tumor rabbits receiving αvβ3-Dxtl-PD NP versus controls. B) Illustrative sections (40x) of Vx 2 tumor following TUNEL staining (brown arrows) using a methyl green nuclear positive reference for tumor area (green arrows). C). Histogram showing a significant (p < 0.05) decrease in proliferation index among Vx2 tumor rabbits receiving αvβ3-Dxtl-PD NP versus controls. D) Representative sections (40x) of Vx2 tumor following PCNA staining (brown arrows) using a methyl green nuclear positive reference for tumor area (green arrows). * p < 0.05. The facile synthesis, development and characterization of a new Sn 2 lipase-labile docetaxel prodrug is reported and shown to be an effective anti-angiogenic agent in vitro and in vivo. The Sn 2 phosphatidylcholine drug stably incorporated into the nanoparticle lipid membrane and did not appreciably release during dissolution against PBS buffer or plasma over three days. Further, overnight exposure of αvβ3-Dxtl-PD NP to plasma spiked with phospholipase enzyme failed to liberate the taxane from the membrane, unless the nanoparticle itself was first “cracked” with alcohol. The bioactivity and efficacy of Dxtl-PD was demonstrated in endothelial cell culture and found to be equivalent to docetaxel, paclitaxel, and paclitaxel prodrug. The effectiveness of αvβ3-Dxtl-PD NP was at least as effective as Taxol® at equimolar doses over 96 hours, with 4-fold numerical advantage noted for the prodrug over the free compound. At earlier time points, in vitro cell metabolism studies demonstrated that free docetaxel had equivalent efficacy to αvβ3-Dxtl-PD NP, indicating that requisite intracellular lipase liberation of docetaxel did not limit prodrug effectiveness at 48 hours, and this result persisted through 96 hours. The effectiveness of αvβ3-Dxtl-PD NP compared with the negative control was demonstrated in the Vx2 rabbit model using MR molecular imaging of angiogenesis. Nontargeted Dxtl-PD nanoparticles had a similar anti-angiogenic response as measured with MR molecular imaging, indicating that passive entrapment of the particles in the tumor neo-/microvasculature was adequate to decrease MR detectable neovasculature. However, histology of these tumors revealed that αvβ3-Dxtl-PD NP impacted tumor progression and apoptosis, which was not appreciated for NT Dxtl-PD NP or the control groups. 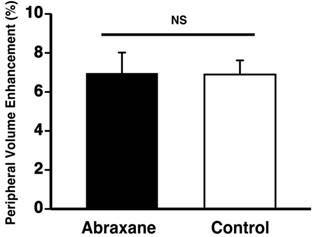 Abraxane® given at an equimolar drug dosage and frequency as the αvβ3-Dxtl-PD NP had no effect on angiogenesis when compared to control rabbits receiving saline only, confirming that the effectiveness of this low taxane exposure was dependent on nanoparticle delivery and concentration at the tumor. Dxtl-PD was not incorporated into the αvβ3-Gd-DOTA nanoparticles to support simultaneous imaging and therapy serially as previously reported in other models. In a previous time course study characterizing MR angiogenesis mapping in the Vx2 tumor on days 9, 12, and 15 post tumor implantation, MR molecular imaging was unable to delineate and differentiate a coherent neovascular pattern or increased integrated MR contrast signal between animals receiving αvβ3-Gd-DOTA PFC NPs or NT-Gd-DOTA PFC NPs on day 9. Although angiogenesis is well known to occur robustly at a microscopic level as tumors grow beyond 2 to 3 mm, the insensitivity of MRI, even using a strong molecular imaging agent such as αvβ3-Gd-DOTA PFC NP, was unable to differentiate specific neovascular targeting from passive nontargeted entrapment in the Vx2 tumor neo/microvasculature on day 9 post implantation. However, on days 12 and 15 of that study, clear differences in neovasculature signal were measured between the two groups and a very close correspondence between the neovasculature pattern determined on day 12 and day 15 in the same animal was illustrated. Consequently, the pursuit of theranostic MR molecular imaging approach beginning on day 8 post-implantation as a baseline imaging reference, as demonstrated in other experimental models, was precluded and a companion diagnostic design with serial treatments followed by terminal imaging measurement was adopted. The direct targeting and delivery of low dose docetaxel to nascent endothelial cells is a distinctly different mechanism of achieving anti-angiogenesis treatment than the vascular endothelial growth factor (VEGF) inhibitors approved to date. Certainly, tumor angiogenesis is a complex process with a dominant role attributed to VEGF. Bevacizumab, anti-VEGF-A, was initially intended to block angiogenesis and vascular permeability by adsorbing VEGF-A in the tumor milieu. However, VEGF-A is produced not only by the tumor but also by surrounding stromal cells, such that monotherapy with the drug was unsuccessful. Ultimately, bevacizumab was approved as the first inhibitor for combination use in metastatic colorectal cancer , then later for non-squamous, non-small cell lung cancer , renal cell carcinoma , and glioblastoma multiforme . Several other VEGF-directed drugs have followed which competitively inhibit the intracellular ATP at the catalytic binding site of tyrosine kinases, including sunitinib (Pfizer), pazopanib (Glaxo-Smith-Kline), sorafenib (Nexavar), vandetanib (Astrazeneca), carbozantinib (Exelixis), axitinib (Inlyta), and linifanib (Abbott). Tyrosine kinase inhibitors (TKI) are designed to blockade the downstream signaling pathways that promote tumor growth and metastasis when stimulated by angiogenic factors. The third class of current anti-angiogenesis inhibitors impact mTOR, mammalian target of rapamycin, which, under upstream control via the PI3K/AKT pathway, influences cell growth by modulating metabolism, protein synthesis, and autophagy. Rapamycin and its analogs, temsirolimus (CCI-779) and everolimus (RAD001), are allosteric inhibitors of mTORC1. In general, these agents have had limited effectiveness because they are specifically directed to mTORC1, and a second mTOR (mTORC2) is able to exert negative feedback to AKT/PKB that can antagonize the anti-tumor effects of the rapalogs. Resistance to all of these drugs may result from negative feedback, invocation of alternative angiogenic pathways that circumvent the blockade, selection pressure for tumor or stem cells able survive the hypoxic environments, induction of cryoprotective tumor cell autophagy or dormancy, or tumor extravasation to better environs. The nanomedicine approach with αvβ3-Dxtl-PD NP is independent of how the neovasculature expansion is stimulated to occur, and the endothelium, which is a normal replicating cell, as opposed to the epigenetically morphing tumor cells, can be anticipated to respond uniformly to a directly targeted nanosystem approach regardless of the tumor type. As with other anti-angiogenesis therapies, αvβ3-Dxtl-PD NP treatment will best be used as an adjuvant combined with effective chemotherapy rather than standalone monotherapy. Further, MR molecular imaging, which was used in this study to assess anti-angiogenesis response, is a robust technique amenable to identifying patient populations most likely to have the greatest treatment benefit-to-risk ratio and longitudinally monitor for recurrence, but it may lack the sensitivity required to detect biologically relevant microscopic levels of neovascularity that may indicate a complete therapeutic response. In the present study, the concept and efficacy of using docetaxel as an Sn 2 lipase labile prodrug was studied and demonstrated in vitro and in vivo. In contradistinction to the original failed pilot studies pursued with αvβ3-paclitaxel (free) NP, the use of Dxtl-PD NPs resulted in significant anti-angiogenesis. Further, Abraxane® given in equivalent doses following the same treatment regimen was ineffective, emphasizing the importance of the targeted drug delivery paradigm. Whereas some effective nanomedicine applications are intended to be improved excipients, providing more extended drug release in circulation, αvβ3-Dxtl-PD NP is an anti-angiogenesis agent that concentrates a small amount of systemically administered taxane directly on the target for a highly potent effect. The synthesis of the Sn 2 docetaxel prodrug was accomplished, which produced a lipophilic prodrug incorporated into the phospholipid surfactant of PFC nanoparticles. In endothelial cell culture, the biopotency of paclitaxel, docetaxel, paclitaxel prodrug and docetaxel prodrug were equivalent. In vitro experiments confirm that the drug was stable in the particle membrane in plasma and whole blood, even in the presence of excess phospholipase. 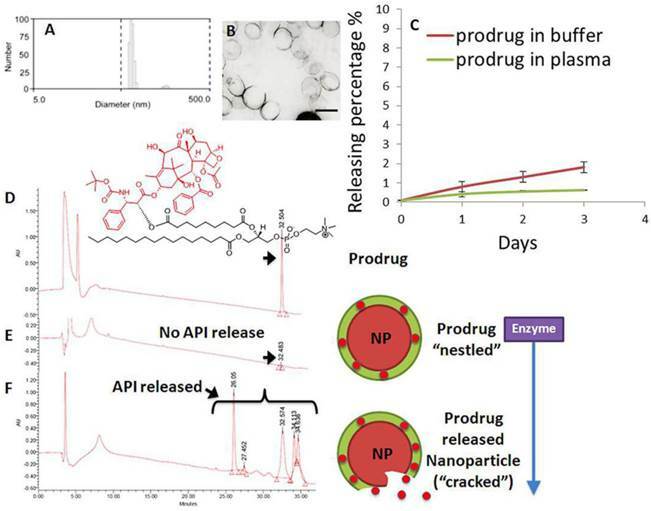 Prodrug-laden particles were bound to target cells, the docetaxel prodrug was delivered and equivalently bioactive to the parent drug in the same nanosystem. In the Vx2 cancer model, αvβ3-Dxtl-PD NP elicited strong anti-angiogenesis effects as assessed by MR neovascular molecular imaging and histopathology, but acute changes in tumor volumes were not appreciated. In contradistinction to current anti-angiogenic treatments, for which the intent to blockade or modulate tumor production of VEGF can be circumvented or ameliorated by countering biochemical mechanisms in the epigenetically morphing tumor cells, αvβ3-Dxtl-PD NP should deliver uniform anti-angiogenic results regardless of the molecular mechanism of neovessel stimulation and may be an effective adjuvant to chemotherapies in aggressive cancers dependent on an expanding rich neovasculature. Sn 2: glycerophospholipids use "sn" notation, stereospecific numbering. By convention the hydroxyl group of the second carbon of glycerol (Sn 2) is on the left on a Fischer projection. The financial support from the AHA under grant number 0835426N (DP), from NIH under grant numbers HL073646 (SAW), HL112518, HL113392, CA154737, CA136398, NS073457, and from the DOD CA100623 is greatly appreciated. Additional support was derived from the International Cooperation and Exchanges Program of the National Ministry of Science and Technology (2009DFB30040) (BS), the National Natural Science Foundation of China (81130028, 30970807,30570527, 31210103913,81225010) (BS), the Key Grant Project of Heilongjiang Province (GA12C302) and the Ph.D. Programs Foundation of Ministry of Education of China (201123071100203) (BS), the National Natural Science Foundation for Young Scholars of China (81101086) (KW), China Postdoctoral Science Foundation (20100471020) (KW), China Postdoctoral Special Science Foundation (2012T50375) (KW) and Medical Scientific Research Foundation of Heilongjiang Province Health Department (2010-156) (KW). Corresponding author: Gregory M. Lanza, MD PhD. Division of Cardiology, Campus Box 8215, 660 Euclid Ave, Washington University School of Medicine, St. Louis, MO 63108. Tel: 314-454-8813, Fax: 314-454-5265, Email: greg.lanzacom.